With Craftsman Outdoors your deck will be designed to compliment the architecture of your home as well as the natural surroundings of it’s setting. With the styles, textures, and colors complimenting the natural beauty, it will become an alluring setting for your new outdoor living space. 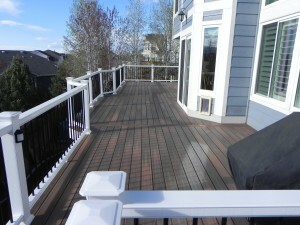 There are many products and material options to consider when planning for your deck and new outdoor living space. We can help you determine whether to go real wood or a low-maintenance alternative as well as the types of distinctive finishes that will work best for your application and make your deck uniquely your own. We have compiled some information on the products that we feel are the best out there and would highly recommend installing. If there are any other products you would want to use on your deck we would be happy to discuss your interests to ensure you get the outdoor living space of your dreams. Take a moment and look through the links on the left of the page to explore the design considerations, materials, and additional accessories that we will guide you through in the process of designing a new deck for your home.